Introduction: India is one of the oldest civilisations and have a remarkable history. After Independence from British rule, it achieved multi-faceted socio-economic progress. Also made a remarkable progress in the field of agriculture, industry, technology and overall economic development. • Lies entirely in Northern hemisphere between latitudes 8°4' N and 37°6' N and longitudes 68°7' E and 97°25' E.
• Divided by Tropic of cancer (23°30' N) in almost two equal parts. • In Southeast, Andaman and Nicobar islands lie in Bay of Bengal. • In Southwest, Lakshadweep islands lie in Arabian Sea. • Total Area of India is 3.28 million square km which is 2.4 percent of the total area of the world. • It is seventh largest country in the world in terms of landmass. including Andaman and Nicobar and Lakshadweep islands is 7,516.6 km. • In the northwest, north and north east of India, young folds mountains bounds it. 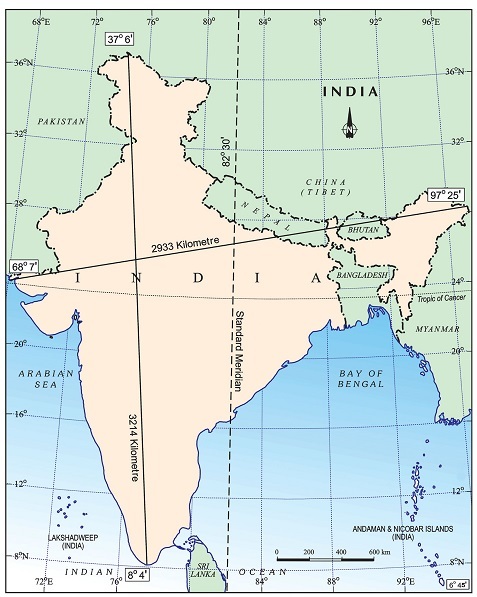 • South of about 22° north latitude, India narrows and finally extends towards the Indian Ocean. It also divides it into two seas, the Arabian Sea on the west and the Bay of Bengal on its east. • The latitudinal and longitudinal extent of the mainland is about 30°. • India’s east-west extent appears to be smaller than the north-south extent. • The time along the Standard Meridian (82°30' E) passing through Mirzapur in UP is taken as the Indian Standard Time for whole country. • The time gap between Arunachal Pradesh present in the east and Gujarat present in the west is about 2 hours. The latitudinal extent influences the duration of day and night, as one moves from south to north. • India is located in the centre of the World between East and the West Asia. • The routes across the Indian ocean which connect the countries of Europe in the West and the countries of East Asia provide a strategic central location to India. • The Deccan Peninsula* helps India to establish close contact with West Asia, Africa and Europe from the western coast and with Southeast and East Asia from the eastern coast. • The Ocean which is south of India given name Indian Ocean as no other country has a long coastline on the Indian Ocean as India has. • The land routes of India are much older than sea route. Various passes across mountains in the north have provided passages to the ancient travellers as ocean limited such interaction for a long time. • The land routes helped India in the exchange of ideas and commodities since ancient times. • India have propagated the ideas of the Upanishads and the Ramayana, the stories of Panchtantra, the Indian numerals and the decimal system as well as given spices, muslin and other merchandise to different countries. • Also, the influence of Greek sculpture, and the architectural styles of dome and minarets from West Asia can be seen in different parts of India. • Maldives Islands are situated to the south of the Lakshadweep Islands. * A peninsula is a piece of land that is bordered by water on three sides but connected to mainland on one side. • The southernmost point of the Indian Union– ‘Indira Point’ got submerged under the sea water in 2004 during the Tsunami. • Since the opening of the Suez Canal in 1869, India’s distance from Europe has been reduced by 7,000 km. • Before 1947, there were two types of states in India – the provinces and the Princely states. → Provinces were ruled directly by British officials who were appointed by the Viceroy. → Princely states were ruled by local, hereditary rulers, who acknowledged sovereignity in return for local autonomy. Helpful na.. This a fair answer exercise questions . Maps also. Thanks for our indian teacher which are shows their experience.